Thirteen hours of betrayals, shankings, geriatric prison escapes, and nun protests later, Orange Is the New Black wrapped up its sophomore season in spectacular fashion, creating a more self-assured and deeper season of television than the first. While the show corrected some of the first season’s biggest stumbles, there are still some adjustments to be made in creating an even better third season. Here are our thoughts on the best and the worst aspects Orange Is the New Black‘s second round in the clink. Litchfield was hardly ever a place of racial harmony and tranquil repentance, but whatever semblance of peace that did exist in those grey walls, Vee smacked it in the head with a giant lock in a sock. Vee was the spark that lit all of the tensions floating around Litchfield ablaze, and her war with Red reverberated through every cell and bunk in the prison. It’s going to be tough to find a villain as twisted and alluring as Vee for Season 3. Vee wasn’t the only new face at Litchfield. There’s a really tricky balance at play when creating a character who is purposefully annoying. OITNB struggled to find that balance with its other new inmate, Brook Soso, whose long asides about Bonnaroo, gluten, cancerous deodorant quickly dovetailed from enjoyable to insufferable. Orange Is the New Black managed to find strands of humanity in the deep black pit of bigotry and gloom that is Mr. Healy, and even the bible-thumping psychosis of Pennsatucky. Even a character like Caputo is revealed to have a good amount of integrity. There’s a war of good vs. evil brewing in every soul, and OITNB excels at creating dynamic, flawed characters that are believable. First, it should be known that I was a staunch defender of Larry during Season 1. His screw-ups were just as mean and twisted as Piper’s, so really they were both semi-horrible people that were made for each other. Unfortunately, Larry has somehow found a way to become even more insufferable in Season 2. Larry’s storyline took up a lot of real estate that would have been better used at the Litch. In Season 2, Poussey graduated from wisecracks and witty asides (as fun as those were) and became much more of a fully realized character. Her strengths, flaws, and passions were all on full display as her friendship with Taystee was stretched to its breaking point. While Possey received a boost in screen time, we got a lot less Sophia. Sure, we got to see the sassy stylist give a full crash course on female anatomy, but the character was sadly left IN the background for most of the season. We did get a tender moment between her and her son, but not much else. Here’s hoping we see more of her once Season 3 rolls around. Another Bad: Where’s the Big Boo backstory? We thought this season was sure to deliver a Big Boo flashback, but the season came and went without a glimpse into the character’s past. We got a Black Cindy flashback for heaven’s sake, but still no info on Big Boo’s life before the Litch. A character as raw and entertaining as Boo certainly needs some fleshing out. While the rundown to the Season 1 finale was very much about the battle between Pennsatucky and Piper, Season 2’s emphasis is much more focused on the other inmates at Litchfield. There’s a mosaic of characters, rivalries, friendships, and relationships in place and Piper is but one little piece in a much larger and vibrant picture. 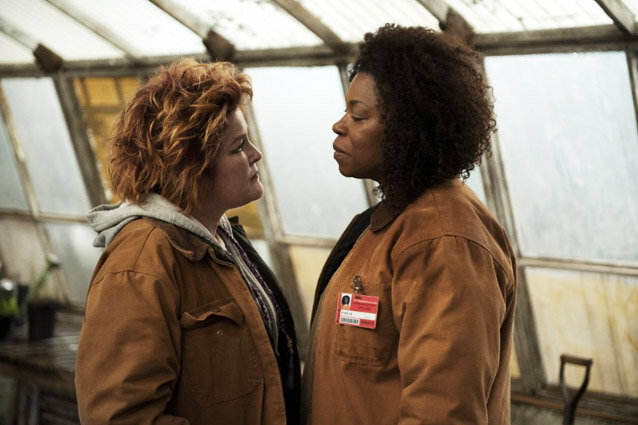 Inmates that were mostly background fodder in Season 1 had their characters and stories fleshed out in Season 2, and the world of Litchfield feels deeper and richer because of it. While the series did well stretch its focus to the other inmates this season, it feels like Piper’s storyline got the short end of the stick. Next to the tense face-off between Vee and Red and Caputo’s mission to expose Fig’s corruption, Piper’s little squabbles with Larry and her attempts to get furlough seemed petty and dull in comparison. There were simply way more interesting things going on this season. The world of Litchfield has managed to get even weirder in Season 2. Carrier cockroaches, hunger strikes, the gaggle of nuns at the front gate, and catholic candles straight killing people with the power of Jesus all helped make season 2 even weirder than the first.